New bigger&better scan of the same comic uploaded before. Synopsis: Kaänga restores a deposed chief to his chieftanship. Synopsis: Fantomah is framed for killing a dog sacred to Anubis and sentenced to death. She calls on Anubis to recognize her innocence and the sacred dogs attack the false priest. Synopsis: Pilot Pete is deranged by a blow to the head during an emergency landing of his plane. In his madness, he allies himself with the Lanchi cannibals and gives his traveling companions, Ann and Tom, to them. 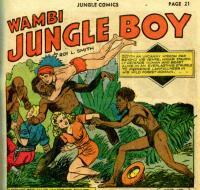 Wambi and his jungle friends manage to rescue them all when Pete recovers his memories and is once more sane. Synopsis: Ivory thieves convince the Bantus that their recently deceased chief is a vampire and that he can only be placated by the Bantus surrendering their ivory. Tabu exposes their plot and reveals that the chief was not even dead, only in a coma induced with a poison by the thieves. Synopsis: The gang follows Terry on a date and then discovers that his lady friend is a Nazi spy. Synopsis: Brief natural history of the mangabey, the mongoose, and the jackal. 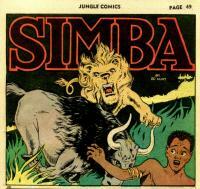 Synopsis: Believing Boko kidnapped by baboons, Simba pursues the baboon troop, only to learn that they have selected Boko to be their leader. Synopsis: Camilla and Ben discover a lost diamond mine controlled by a lost hermit. The hermit is determined to kill Ben and marry Camilla, but he meets his own end at the hands of his pet gorilla. Credits: Script: ? [as Victor Ibsen] | Pencils: Frank Frollo ?